The local election is just around the corner and your vote for Ballot Issue 4C is critical to Carbondale Fire’s service level. 4C asks you to allow Carbondale Fire to continue funding the costs of maintaining current levels of essential firefighting, paramedic and emergency medical services, improve current communications equipment, upgrade ambulances to better serve our population and further educate our team (comprised of 21 paid staff which includes 14 designated paid responders, administration, and 50+ volunteer firefighters and EMTs). Professional development of firefighters and emergency responders is critical to the level of service Carbondale Fire provides our district and neighboring communities.The continuation of the mill levy override will allow Carbondale Fire to maintain its current budget and continue to provide quality and speedy fire and ambulance response. The Board of Directors of the Carbondale & Rural Fire Protection District has placed a ballot question on the November 7, 2017, general election ballot requesting a three year extension of the 1.75 mill levy override. Without the extension of the mill levy override, Carbondale Fire will have to make significant changes impacting jobs, level of service, equipment and continued education and training. 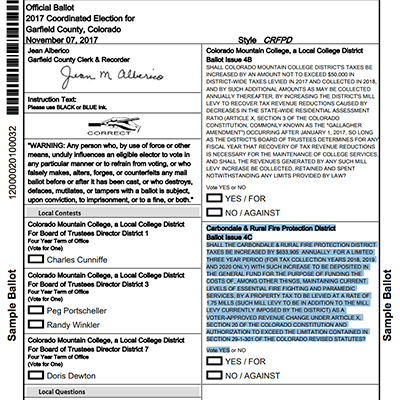 For more information about your ballot and how to vote by November 7th, please visit your county’s website: Pitkin County, Garfield County. Remember to vote in this local election, read the ballot initiatives closely and remember that your vote impacts the level of service we provide.